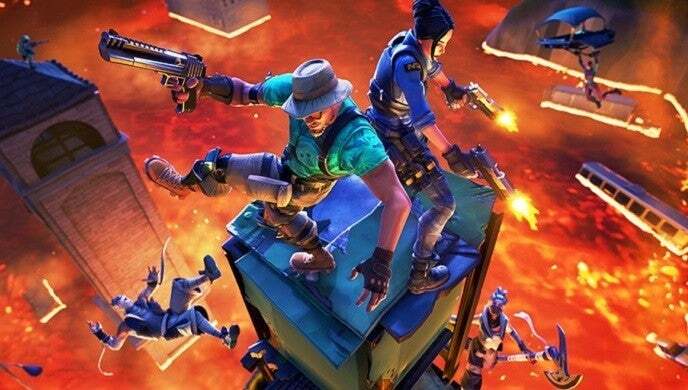 Fortnite players’ building skills will be put to the test soon in a new Limited Time mode called “The Floor Is Lava” that forces them to say above molten lava that covers the ground. The in-game news feed was updated recently to the image below where two players sit atop a tower while looking down at those beneath them and an ocean of lava that’s now covering the island. The new mode is coming soon, according to the news update, though a specific release date isn’t known yet. The description of the game mode says that players will either be able to build themselves out of a situation where they’d fall in the lava or will have to find the high ground on their own as we see some players doing in the concept art below. It looks as though we can at least expect Duos to be an option in the mode given how the two players are standing together on the tower, though the full specifics for the mode won’t be known until it’s released. “Get to high ground or build above the lava that’s overtaking the island,” the description of the new Limited Time Mode reads. The volcano that emerged on Fortnite’s map this season is likely the catalyst for the game mode to explain why everything’s been covered in lava. Players who’ve been keeping up with the updates from Epic Games may recall one State of Development post from February that talked about how Limited Time Modes would be improved in the coming months to update existing modes and pave the way for new ones. In that post, Epic Games mentioned the new lava-filled mode that it said was “more involved” than other Limited Time Modes. This new Limited Time Mode might also give creative players some inspiration for their submissions to Epic Games’ LTM Creator Contest. The contest was announced last week and tasks players with coming up with their own concepts for the rotating game modes. The winner, Epic Games said, will have their idea featured as a real, playable game mode. The Floor Is Lava is expected to release on one of Fortnite’s upcoming updates.